Live Life. Two words that mean something different to everyone. For me they mean changing the routine, which I try to do regularly in my cooking. I find it keeps it fun and interesting. One area of cooking where I don’t change the routine very often is when I prepare weeknight side dishes. I usually end up putting together the same green salad or frozen cooked vegetable and after awhile it becomes a bore. When food gets boring, it’s time to look for new ideas! Cookbooks are a great place to start! Flipping though my cookbook collection I was inspired by an Anne Lindsay recipe called Two-Cabbage Stir-Fry. It reminded me of a cooked cabbage dish my mom used to make when I was a kid and I absolutely loved it! The only drawback to cooked cabbage dishes is it’s a pain to have to slice the cabbage. Who wants to spend time doing that for a weeknight side dish? 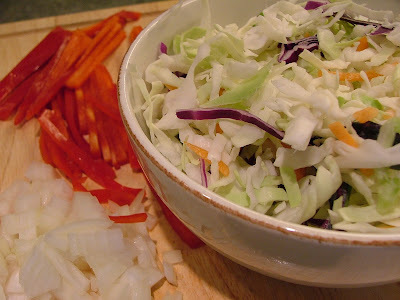 A good alternative is to use store bought bagged coleslaw. It has both the green and red cabbage plus some shredded carrots. 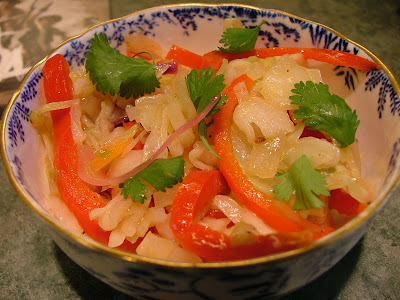 I like to toss in a sliced red bell pepper for color and crunchy texture and use cilantro leaves or chopped green onions as a garnish. Using the bagged coleslaw method, this dish took about 10 minutes to prepare. 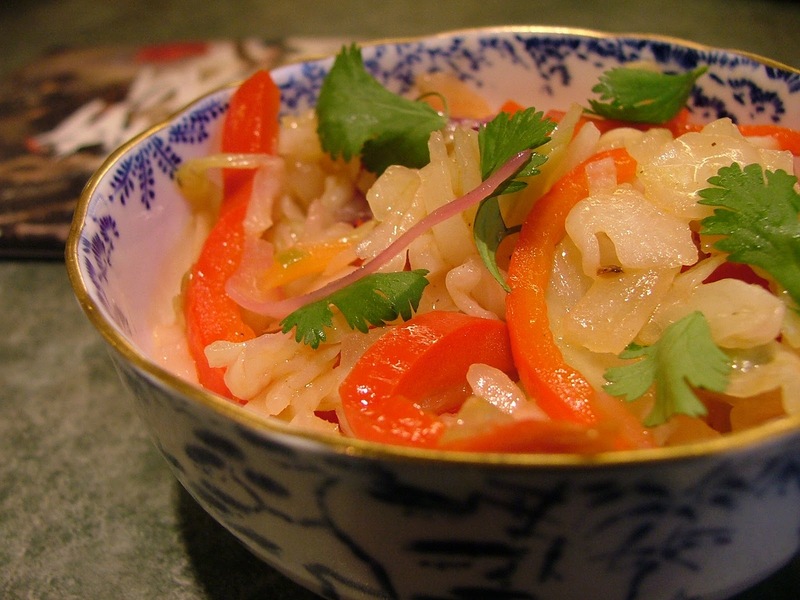 It turned out to be a sweet and sour side dish that was extremely flavorful! It was much more exciting than an uninspired salad or cooked frozen corn or peas. As for a song pairing, my suggestion is to listen to “Viva la Vida” by Coldplay while preparing this dish. Translated the title means "Living Life"! It’s one of those songs that can give you an instant shot of inspiration…just like a new recipe! How bout you? Where do you look for inspiration when your cooking routine begins to feel dull? In a small bowl, whisk together vinegar, water, ginger, sesame oil and cornstarch. Lightly season with salt and pepper. In a large wok, heat canola oil over medium heat. Add red pepper and onion and cook until vegetables begin to slightly soften, about 2 minutes. Add cabbage and stir-fry until tender, about 3 minutes. Pour vinegar mixture into wok and stir-fry for 1 minute more. Garnish with cilantro and serve.